No Rain on my Suede: Flowers in the Sprang! 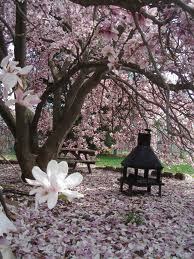 One of my neighbors up the block has 2 mature Magnolia trees in their side yard, absolutely stunning when in full bloom. This time of year is where I become obsessed w/ the development of these trees. I just noticed yesterday on my walk w/ Baxter and Samson that the Magnolia buds are forming, my excitement is stirring because I know....that in just 2-3 weeks I will be standing in front of a gorgeous display of feathery white and pink blossoms (hopefully on a nice sunny morning w/ a few birds chirping---perhaps mixed w/ a few aromatic whiffs off a lilac bush----ahhh hurven on earth) I'm in love w/ flowering trees. I played farmville earlier this year---completely addicted for a few months. I didn't plant rows of corn or raise pigs---NO! I spent my life on this planet developing and planting digital flowering trees in beautiful symmetry. I had a perimeter of orange trees and then planted rows or red/white/pink/purple trees with a lit'l wishing well for kicks, it was lovely....time well spent. I haven't been back to my lit'l farm in ages, I imagine my utopia is now a shriveled/lifeless mess---probably commanded by a ole witch and a black cat stirring a cauldron of pain and turmoil. I'll never go back to that digital paradise, no.... it would pain me too much. I want a REAL grove of trees to call my own....doesn't that sound nice? "Pardon me, don't say another word...follow.....I would like to continue this conversation in my grove" or "Meet me in my grove ........I've got something to show you" or "god--d*%&$t!! don't pee there------that's my Grove!". 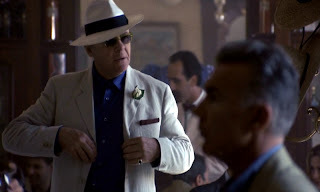 I'd ditch my polyester black pant for a flowing white linen ensemble, I'd start wearing a hairpiece like the one Hannibal Lecter wears in the final scene of Silence of the Lambs. I would offer sweet tea to my guests---but NOT in mason jars---I can't stand them! I don't understand that concept---people think its quaint but its NOT, its hard to get a good grip w/ your lip to the rim. ugghhh the worst. So with acceptable glassware we continue to the shade of the grove where we will find a bench and maybe a koi pond..... why the hell not, we could all use a bit more serenity....but no making penny wishes in this pond---that copper can be Lethal! I will hold quaint conversations amongst the flowering beauty--- maybe I'll install some outdoor speakers--the kind that look like rocks. I can only listen to chirping birds for so long---got to introduce some Elton to the scene before I loose my mind, "someone saved my life tonight". Sounds nice, so lovely---I hope my path leads me there someday. If not.....I guess I will have to settle creeping on my neighbors yard.....dressed in my traditional black polypants, bald head while building the reputation of neighborhood Lurker! yeah............ either way....... I'm cool wit it! I LOVE magnolias. Unfortunately in Brisbane, Australia, our winters are not cold enough for good flowering. I love spring for its flowering trees. I planted a magnolia in front of my last house, but, alas, I managed to kill it with love. Or possibly the draught did it. We had a magnolia tree in the front yard of our old house. I still like to drive past on occasion and check its progress. It's stunning in the spring.